Since Monday 15 August, the death toll has risen to 19. Among these, Abdul Kareem al Hakeemi, an MSF staff memeber has died from injuries caused by the blast. Late last night three of the five patients hospitalised after yesterday’s airstrike in northwest Yemen died, raising the death toll from 11 to 14 people, according to the latest information gathered by Médecins Sans Frontières (MSF) teams in Hajjah. The medical team did all they possibly could for the patients, but they arrived in the hospital in extremely critical condition. The death toll includes Abdul Kareem al Hakeemi, an MSF staff member who died from injuries caused by the blast. Twenty-four people were injured in the airstrike. MSF is still surveying the damage and will launch its own investigation into the attack. Abs hospital in northwest Yemen was hit by an airstrike yesterday afternoon at 15.45 local time, killing at least 11 people and injuring at least 19. The blast immediately killed nine people, including a Médecins Sans Frontières (MSF) staff member, and two more patients died while being transferred to Al Jamhouri hospital. Five patients remain hospitalised. 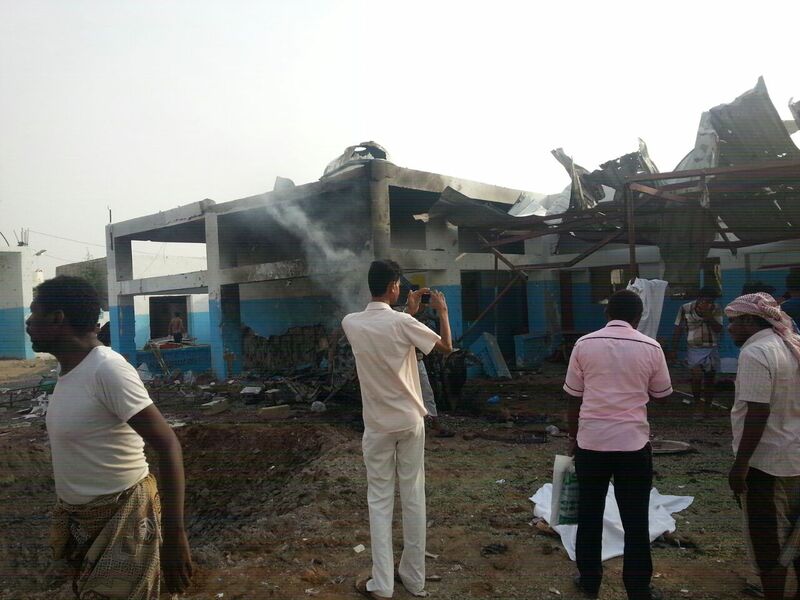 Abs hospital, in Hajjah governorate and supported by MSF since July 2015, has been partially destroyed, and all the remaining patients and staff have been evacuated. The GPS coordinates of the hospital were repeatedly shared with all parties to the conflict, including the Saudi-led coalition, and its location was well- known. “This is the fourth attack against an MSF facility in less than 12 months," says Teresa Sancristóval, desk manager for the Emergency Unit in Yemen. "Once again, today we witness the tragic consequences of the bombing of a hospital. Once again, a fully functional hospital full of patients and MSF national and international staff members, was bombed in a war that has shown no for respect medical facilities or patients. "An aerial bomb hit the hospital compound, causing 11 people to lose their lives. "Even with the recent United Nations resolution calling for an end to attacks on medical facilities and with the high level declarations of commitment to International Humanitarian Law, nothing seems to be done to make parties involved in the conflict in Yemen respect medical staff and patients. A scene from inside Abs Hospital in the immediate aftermath of the bombing. "Without action, these public gestures are meaningless for today's victims. Either intentional or a result of a negligence, this is unacceptable”. “People in Yemen continue to be killed and injured while seeking medical care. The violence in Yemen is having a disproportionate burden on civilians. We want to express our outrage at having to send condolences once more to the families of our staff member and 10 patients, who should have been safe inside a hospital." MSF asks all parties, and particularly to the Saudi-led coalition responsible for the attack, to guarantee that such attacks do not happen again. Since July 2015, 4,611 patients have been treated at the facility, the main hospital functioning in the Western part of Hajjah Governorate. It had a 14 bed Emergency Room, a maternity unit and surgery unit. In the last weeks the hospital had seen an increase in wounded patients, mostly victims of recent clashes and the aerial campaign in the area. At the moment of the strike, there were 23 patients in surgery, 25 in the maternity ward, 13 new borns, and 12 in paediatrics. The hospital had admitted several war wounded patients during the day. The number of patients in the Emergency Room is pending further clarification. MSF is active in 11 hospitals and health centres, and providing support to another 18 hospitals or health centres in eight governorates: Aden, Al-Dhale’, Taiz, Saada, Amran, Hajjah, Ibb and Sana’a governorates. More than 2,000 MSF staff are currently working in Yemen, including 90 international staff.